2018 has been a great at the Point. After all the flooding in 2017, this year was a pleasant return to normal. Claudine and I want to thank all of our Carriage House friends, new and old, who graced us with their presence this year. After hundreds (thousands?) of chocolate chip cookies, hundreds of breakfasts, and countless stories and songs, we are drawing an end to our 2018 season, and closing for the winter. Our last day this season was Oct 16. We will reopen on May 1, 2019, and look forward to seeing all of you next summer. If you would like to make a reservation, please visit our website and look under the “Accommodations” tab and click on “Rates and Reservations” where you will find an email link, or feel free to call Jerry at 262-490-8293. If you are on our website, www.carriage-house-inn.com, take some time to browse around all the wonderful information developed and maintained by Cherie Layton at TMB Studios. 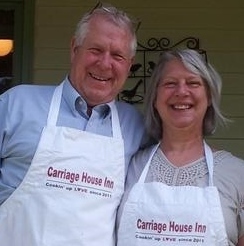 Thanks again for staying with us at the Carriage House Inn, and we look forward to serving your lodging needs even better in 2019!